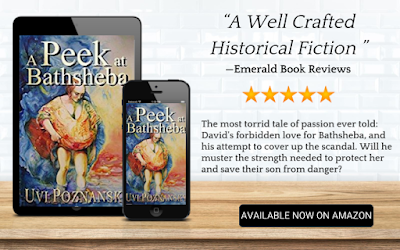 This is the second book in the David Chronicles (A Peek at Bathsheba) by Uvi Poznansky. 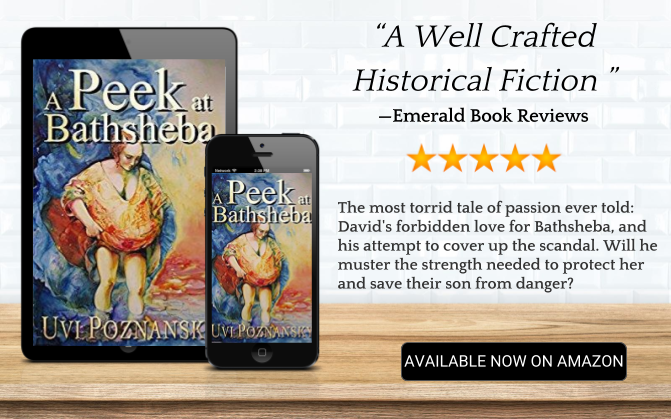 The author weaves a fascinating tale where David is besotted by Bathsheba, the wife of one of his faithful soldiers, Uriah. Consumed by lust, he gets her pregnant, and in order to cover up the scandal, sends Uriah to his death. The story is crafted in such a way that it is told in David’s own words, so to speak. Poznansky gets inside David’s mind and offers the reader a unique perspective in his torment over his transgressions, and his desire for redemption. However, what we discover is his lack of will to redeem himself. This captivating and commendable work had me immersed from the beginning. The story flowed from scene to scene with ease, and the author shows exceptional ability when it comes to storytelling. There are plenty of attention-grabbing moments in this page turner that will take the reader on a mesmerizing journey! It’s one of those books that come along once in a while that makes you want to read it non-stop until you get to the end. I’m giving nothing away here. And this, I hope, will only add to the mystery and enjoyment for the reader.